Set the paprika and nutmeg aside. Place all remaining ingredients (whole seeds, cinnamon stick and cloves) in a small frying pan and dry roast over medium-high heat, tossing regularly to prevent scorching, for 3-4 minutes or until very fragrant. Transfer to a spice or coffee grinder and let cool. Add the paprika and grate nutmeg and grind all the ingredients to a fine powder. Use half of this spice powder. Heat gee in a large pan over medium-high heat and fry the chicken pieces on both sides until the skin is brown and crispy. Add three cups water and chicken stock, one teaspoon salt, and half of the previously made Arabic spice mix. While chicken is cooking heat vegetable oil in a small pan, add onion, ginger garlic, cardamom, cinnamon, cloves and fry the onions until starting to brown, about 10-12 minutes. Add the vegetables and saute for another 2 minutes. Return the sauted vegetable mixture into the chicken pan and stir to combine. Bring it to a boil, reduce the heat to low, cover and simmer for 45 minutes. Take the chicken pieces out from the stock and arrange on a baking tray, and bake at 200 C for 20 minutes. Add rice and salt into the chicken stock, add extra water if needed to cook rice and reduce the heat to low, cover, and cook until rice is cooked. When rice is cooked sprinkle rose water on top of rice. 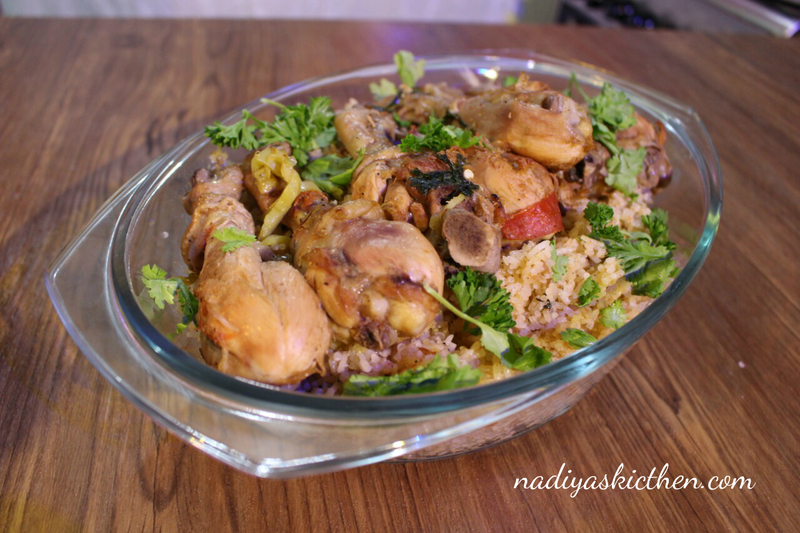 Transfer the rice to a serving dish, arrange baked chicken pieces on top of rice and sprinkle with coriander leaves. Serve with a green salad.